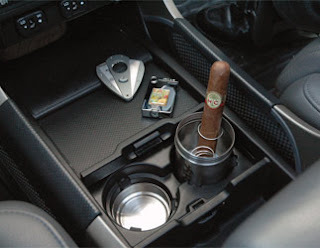 As I was searching online for Digital Hygrometers for the Humidor I am building (read previous entries 1-2-3) I came across this very simple, yet only people like me who would appreciate it dearly, Portable Car Ashtray that fits in most cup holders. Why am I excited? I'll tell you... one of my favorite places to smoke a cigar is in my car. The closed space really give another experience for the cigar smoker, it will get you deeper into your cigar, it intensifies the aromas and flavors which makes it lasts much much longer. What I currently use in my car are the standard small flip-in-dashboard ashtrays and a cup holder ashtray. Every time I smoke in the car, I would have to hold my cigar in hand at all time. The flip ashtray would not hold it and the cup holder would extinguish the cigar since it will be burn faced down. So its mouth - hand, hand - mouth type of smoking, it would be nice to rest the cigar for a little and that's why i got excited about the XIKAR Car Ashtray Can. 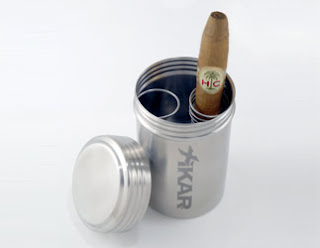 XIKAR are known for the stainless steel smoking accessories and lighters. Their new Portable Can Ashtray as they call it, is the answer to our smoking in-car problems. Screw-able lid keeps the ashes and aromas contained until the next cigar. .. I smoke one cigar per day maybe I will start smoking in the car with this holder.